My husband Howard is preparing for aneurysm surgery in a few weeks. We are running to the doctor regularly for tests, more tests, etc. etc. etc. That leaves me little time for genealogical research. In addition, I’ve been having problems with my computer. As a result, I am taking a leave of absence and will not be on this site until AFTER matters settle down. That could be a couple of months or more. I have not given up the ship. I’m merely reordering my priorities. 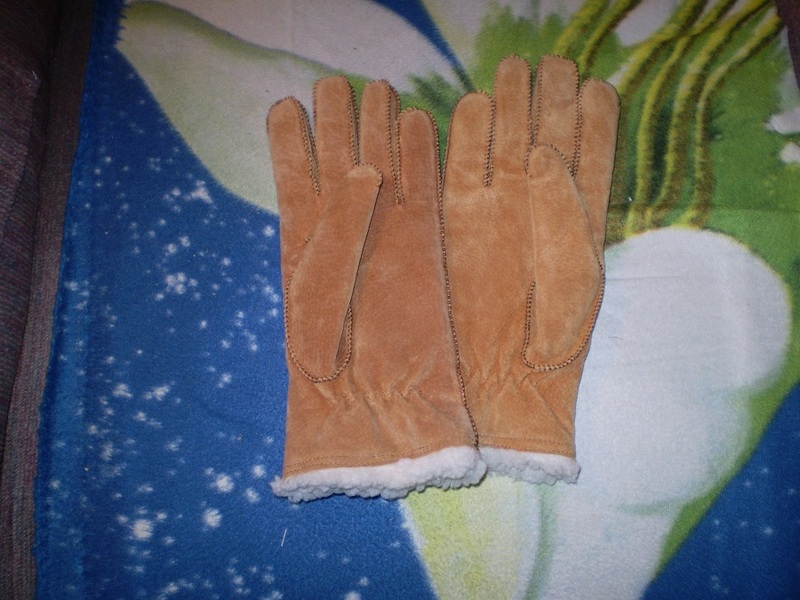 My husband Howard gave me a pair of new gloves for Christmas this year. It bothered him that I was still wearing my mother’s knitted pair of gloves, especially since she passed away in 2003. 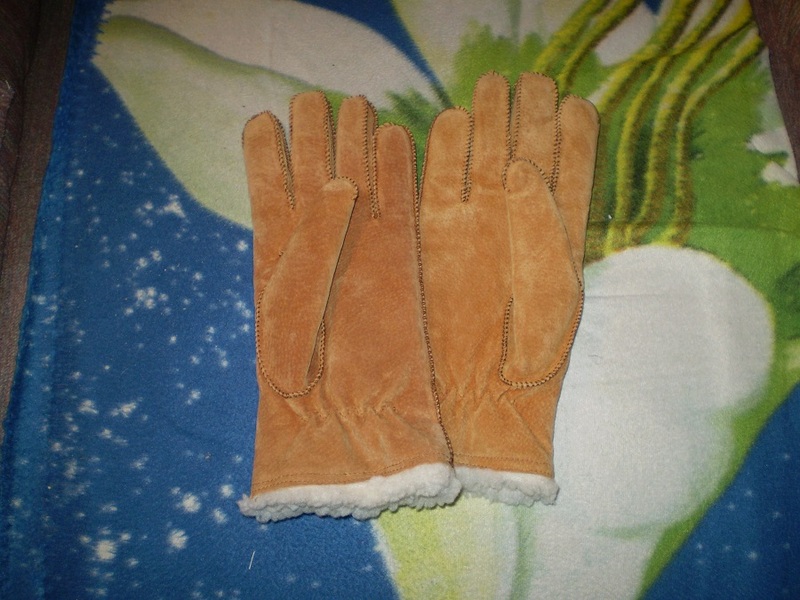 So while on his shopping spree, he took special notice of available gloves and purchased this pair for me. Naturally, I was pleased! In addition to the warmth of these gloves, the pair matched the heavy coat I wear when the temperature dips below freezing. And since the temperature hovered around zero on Christmas Eve, I elected to wear this pair to the evening service. We crept out to the car slowly, hoping not to measure our lengths on the ice. The air was really cold and in the darkness, we could barely see where we were going. Once safe inside the car, we drove over to the church and utilized our same creeping method across the parking lot, breathing sighs of relief once we were inside. The church was especially beautiful that evening! 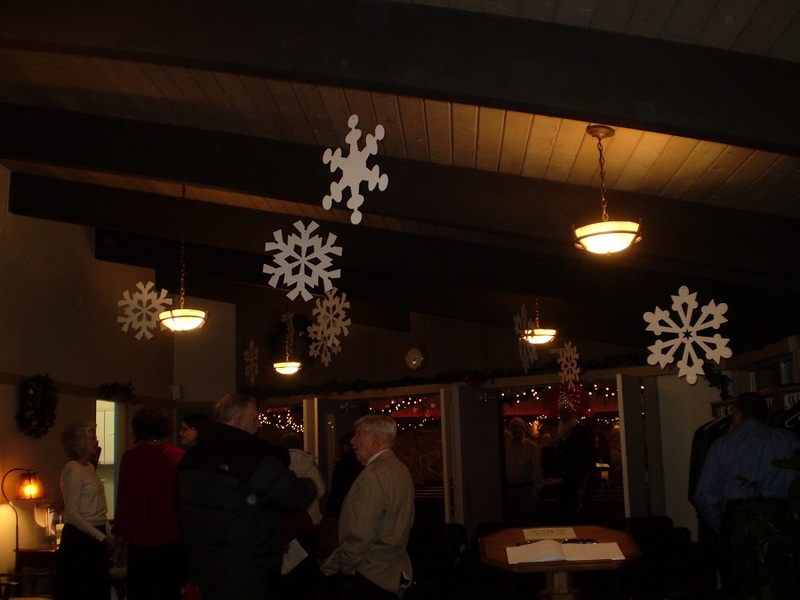 These large snowflakes graced the ceiling of the foyer. 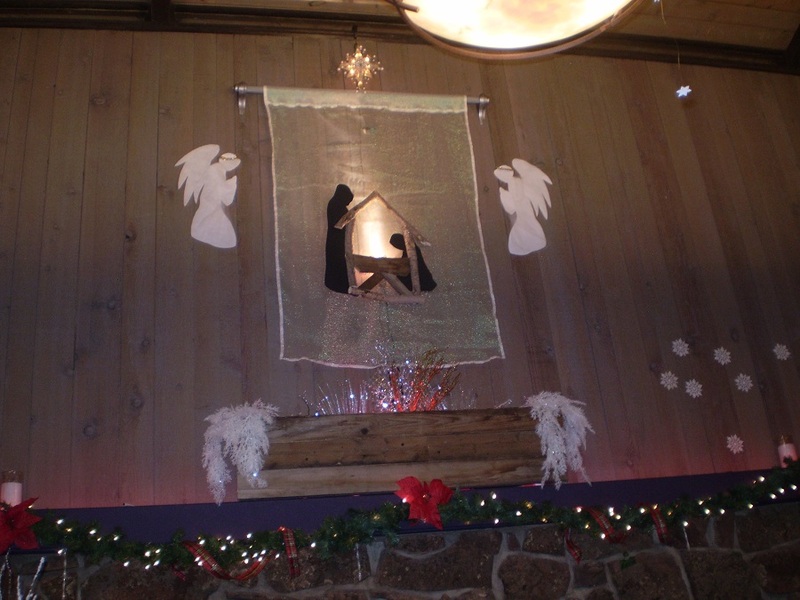 The shepherds were keeping watch over their flocks by night! 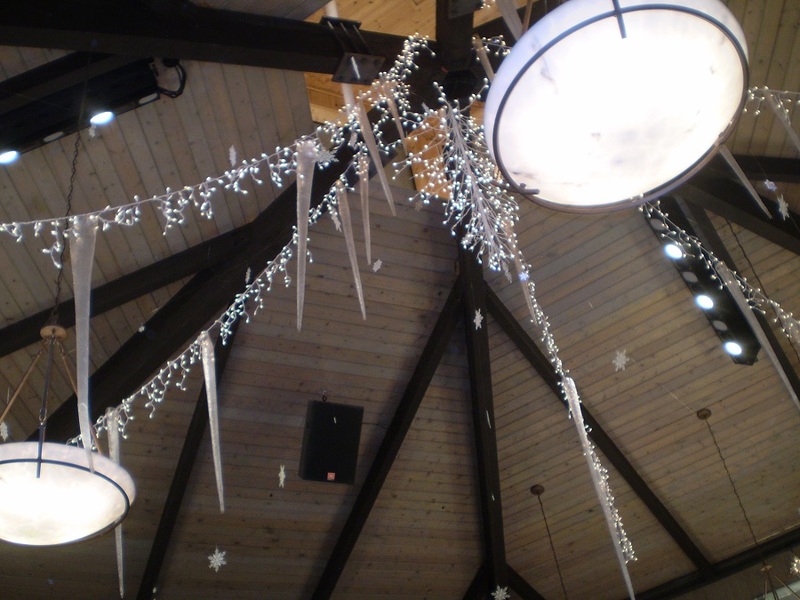 These icicles extend from the beams overhead. 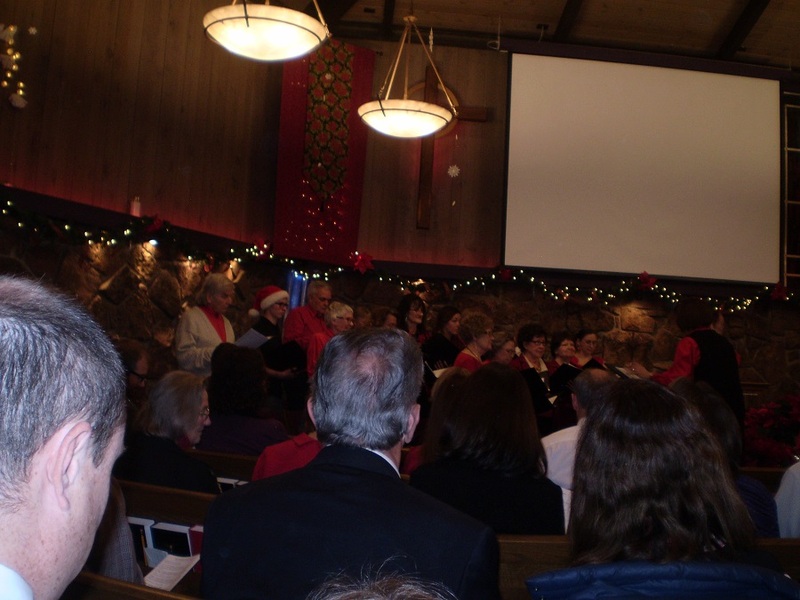 The church was packed. Pastor John walked around greeting new arrivals! “Where are my gloves?” I asked. We looked around to no avail. People sitting with us also looked around. Nothing! “You dropped them in the foyer!” Howard suggested. I climbed over a partial row of people and dashed around to the foyer. The foyer was packed with people, and chairs extended back toward the dessert table. 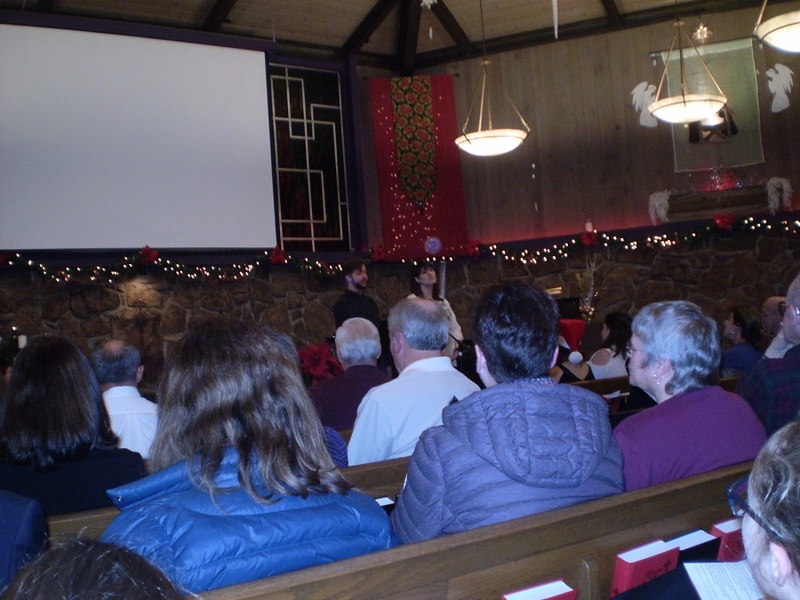 The sanctuary and the foyer were both full of people! My search clueless, I returned to the sanctuary and to my seat. It wasn’t as though these gloves were the only pair left in the universe. Howard gave me these gloves. I had been looking for something like them for a long time. The chance of finding a perfectly matching pair was non-existent. 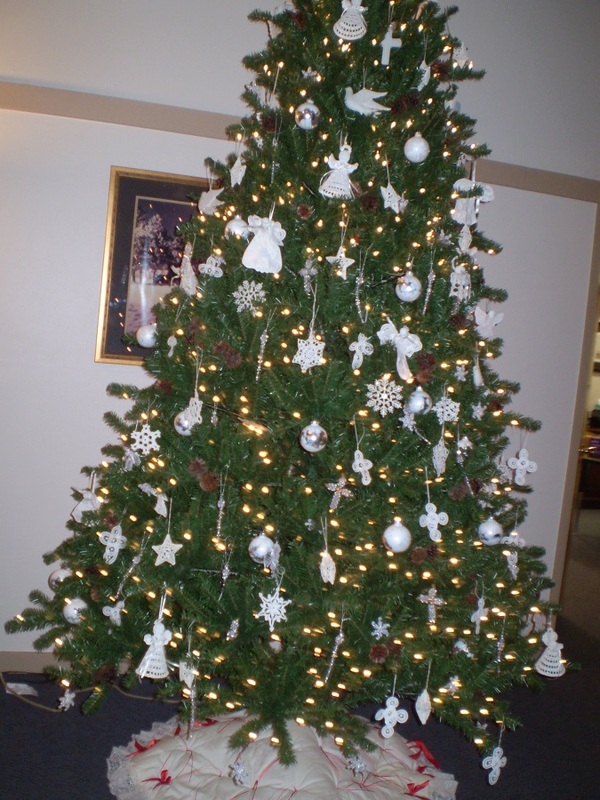 My Joy to the World was slowly becoming Where, Oh Where Did My Little Gloves Go?–hardly a Christmas song! The Gospel Ensemble harmonized well. And the duet provided icing on the cake, along with Pastor John’s sermon! And what did I do? I sat silently, retracing my steps from the moment when I left the car! I felt like Scarlett O’Hara plotting her plan of attack during the family devotions! 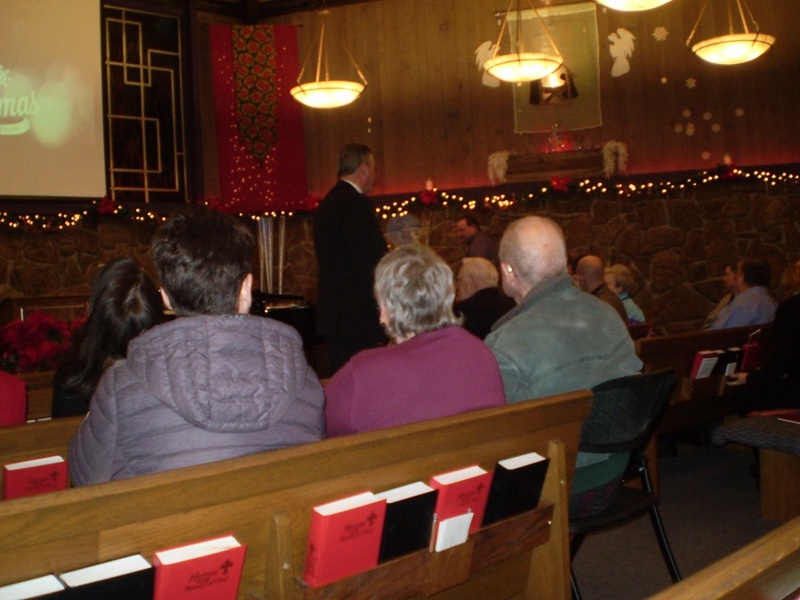 –followed by the Offertory, the Special Music by the Duet, the Lighting of the Christmas Candle and Sharing the Light of Christ. 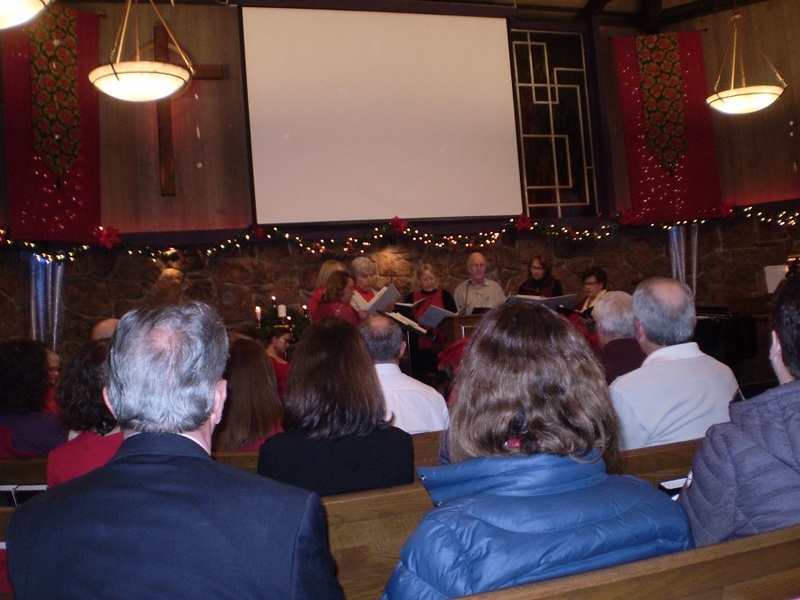 After Silent Night and Pastor John’s Charge and Benediction, we departed. My speed to the foyer broke all records! After shaking Pastor John’s hand, I circled the coat rack just in case someone had placed the gloves on the rack above the coats. 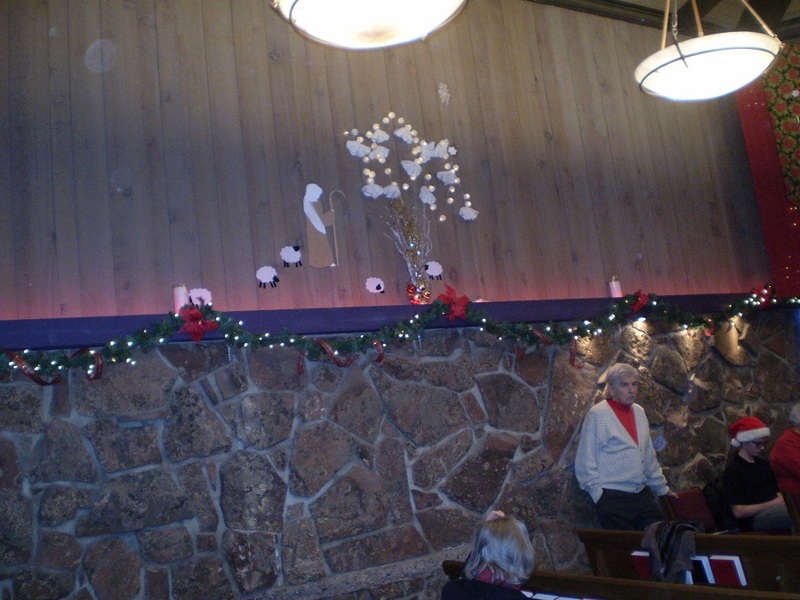 Then I headed directly for the chair beside the table at the far end. I was like a cartoon in slow motion. 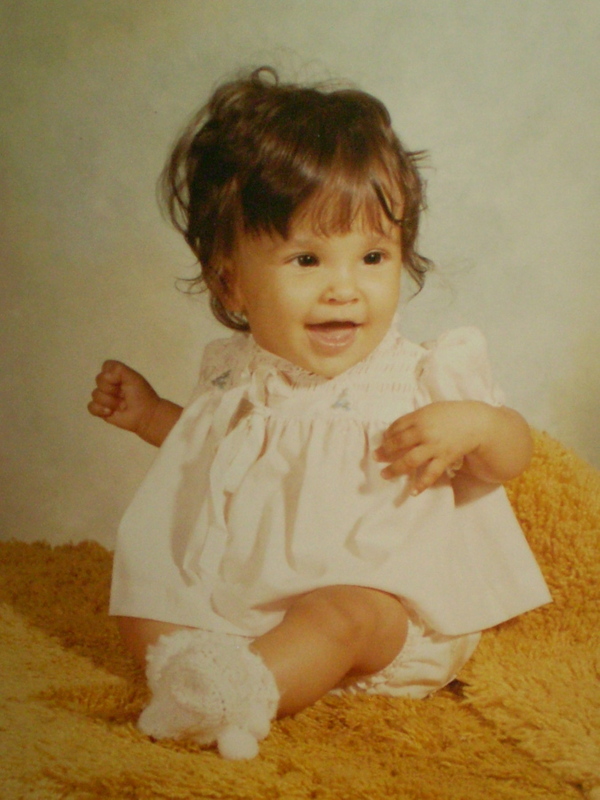 I can still picture my movement toward the table and to the chair beside it, reliving the rounding that table. And what did I see on that chair? My lost gloves–unmoved and intact–untouched in a crowded church full of people–exactly where I had left them! I must keep my guardian angel busy! The last full day of Howard’s hospitalization. Our daughter Debbie came to visit him. This article was written for our church’s Advent devotional November 18, 2017. I elected to include it here. Howard’s stroke occurred September 17, 2017–the fourteenth anniversary of my mother’s passing. She passed away September 17, 2003. I didn’t realize that until after I completed the article. September 17, 2017 began as any normal Sunday: breakfast followed by church and a quick stop at the super market on our way home. It also meant dragging the trash cans down to the street for pick-up the following day. That afternoon, we settled in for the Bronco game: Denver vs. Dallas. (Denver won, by the way). Then came an early evening dinner and an all-evening movie—Giant, as I recall. The unexpected occurred at 9:00 just as the movie was ending and just as Howard headed toward the kitchen to take his evening pills. “What are you doing?” I called out. When a strange voice sounded, I knew I needed to get out to the kitchen to investigate. There stood Howard: arms flailing about—feet kicking the cupboard—his voice garbled! He tried to grab the edge of the sink and missed. I seized his hands to steady him, completely clueless as to what was happening. Presently, I steadied him and maneuvered him to a chair in the living room. Then his voice cleared. He went to bed and fell asleep quickly. And I believed that he was fine when I heard his snoring. We need to go to Kaiser in the morning! I resolved. By the end of the evening, the attendants expressed surprise. “I get to go home then?” Howard asked. Howard was in ICU at Good Sam’s for a few days. He was then moved up to the fourth floor. They told him his Warfarin level needed to be between 2-3. Several therapists checked him out over the following days. He was given a memory test on Thursday that he flubbed. But the next day, he passed the test with flying colors. He also had several visitors during his stay: Pastor John came in twice; Renee—our receptionist friend from the cancer center; our daughter Debbie, who came on Friday. Pastor John stopped in when Howard was still in ICU. I don’t remember what we were talking about, but Howard and I were both laughing when he entered the room. John’s comment: “What is this!” He thought Howard would be in dismal shape as many people are after a stroke. We even had a real estate closing in Howard’s room on Thursday. The realtor’s comment? “This is the first time I’ve ever conducted a closing in a hospital room!” It was a first experience for the title person as well. The hospital staff had him on his feet and walking by Thursday into Friday and by Saturday afternoon, I was able to bring him home. He was in church on Sunday! “It’s a miracle!” Howard told her. The stroke occurred two months ago yesterday. Two months later, Howard is walking without use of his cane. He leaves it at home on most occasions unless planning to walk any distance. His blood pressure and pulse have stabilized. His memory is strong. His gait is strong. We’ve had a busy week with relatives from out of state—a mountain jaunt to Georgetown and Gilpin County—shopping—all the exciting things to do just prior to Thanksgiving. Our hearts are full of joy as we enter the Advent season. Indeed, Howard’s healing was and is a miracle—and one we will long remember and share with others! Taking a Break for a While! Just letting you know that I am taking a break from my blog for a while. Howard had a stroke a week ago. I was at the hospital each day last week and was completely exhausted when I arrived home at night. He’s home now, but we have to see doctors for a while. After all of this settles down here, I will be back doing genealogy and writing these stories again. It was one of those hot, sticky Missouri summers where the sweat rolled off of us, causing us to stick to the furniture. We had just returned from an afternoon swim at the local lake. Brian and Debbie hurried down the lane to the pond behind the house where they were building a fort. I landed on an upholstered platform rocker, wondering when autumn would fall. Presently, I heard the back door slam, water running in the bathtub and the door slam once again. No answer. I looked through the window and saw him running down the path. Howard was busy pulling weeds in the front yard. He was always busy out there. As for me, I pulled the knob on the TV set and collapsed once again on the chair. About a half hour later, I wandered down the hallway to the bathroom, where I was greeted by a loud sound from the bathtub. What in the world is that? Peering over the edge of the tub, I was greeted by a large bull frog sitting in water. And I wasted no time in racing out to the back deck to register my displeasure. Brian appeared at the end of the path. I stood at the window and watched Brian carry him down the path toward the pond. 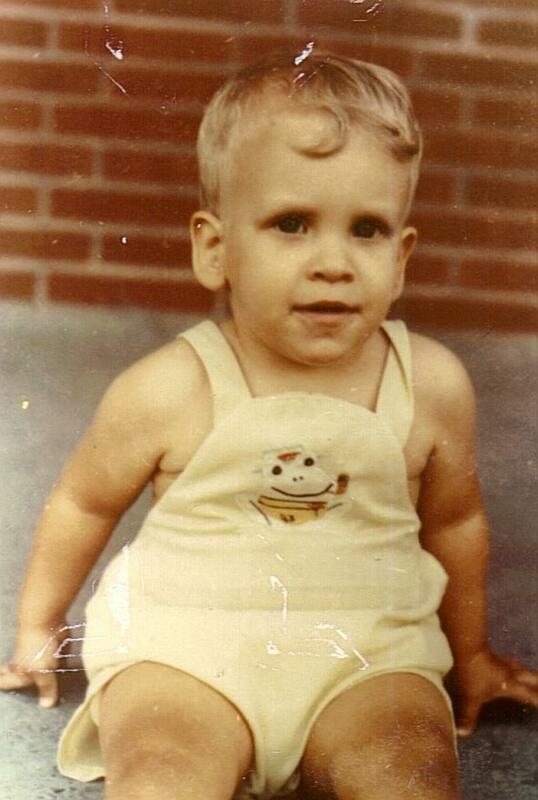 Brian Scott Beall was born August 6, 1968 at 3:45 P.M. in St. Anthony’s Hospital, Louisville, Kentucky–our first born child. And I must admit I was somewhat terrified. Unlike many of my friends from school and my sister, I did no babysitting while growing up. 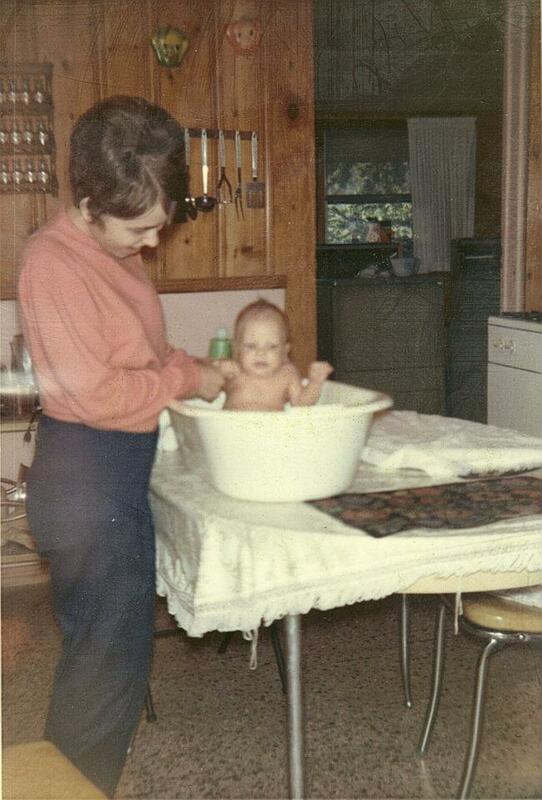 At most, I may have held one or two babies–but beyond that, I was clueless. 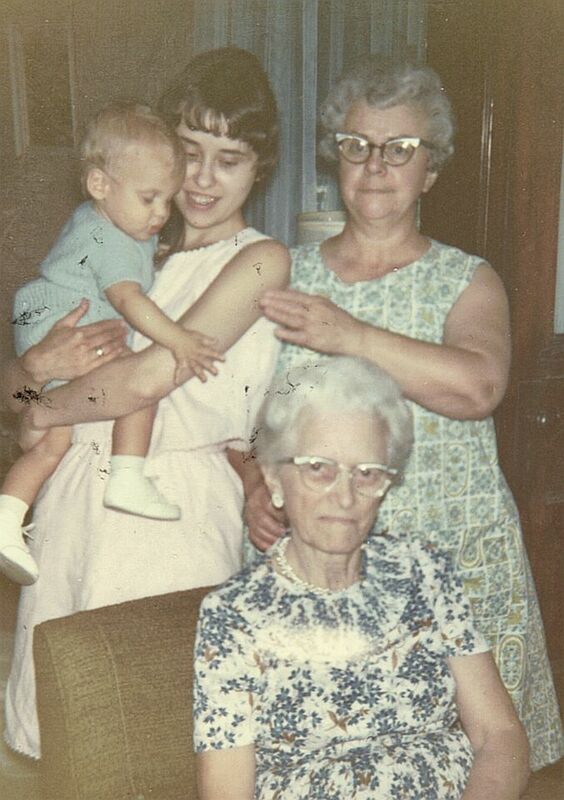 My mother-in-law, Mildred Warfield Beall, came to stay with me my first week home. Howard was teaching school and the year was just beginning for him. Rather than leave me alone to my own uncertainties, Mildred came to the rescue. I don’t know what I would have done without her. And I cried after she returned home. 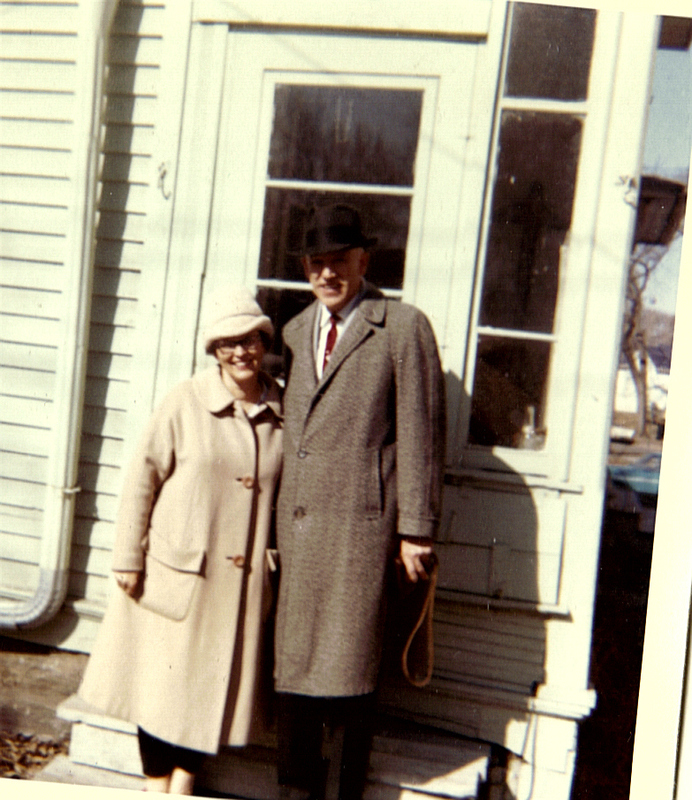 Howard’s parents: Mildred Lee Warfield Beall (1917-2007) and Rev. Edward Leyburn Beall (1907-1992) standing behind their house in Cedar Rapids, Iowa, Winter 1963. Brian and cousin Kari Jo’s baptism, November 1968, Farmington Presbyterian Church, Farmington, Missouri. Their grandfather, Rev. 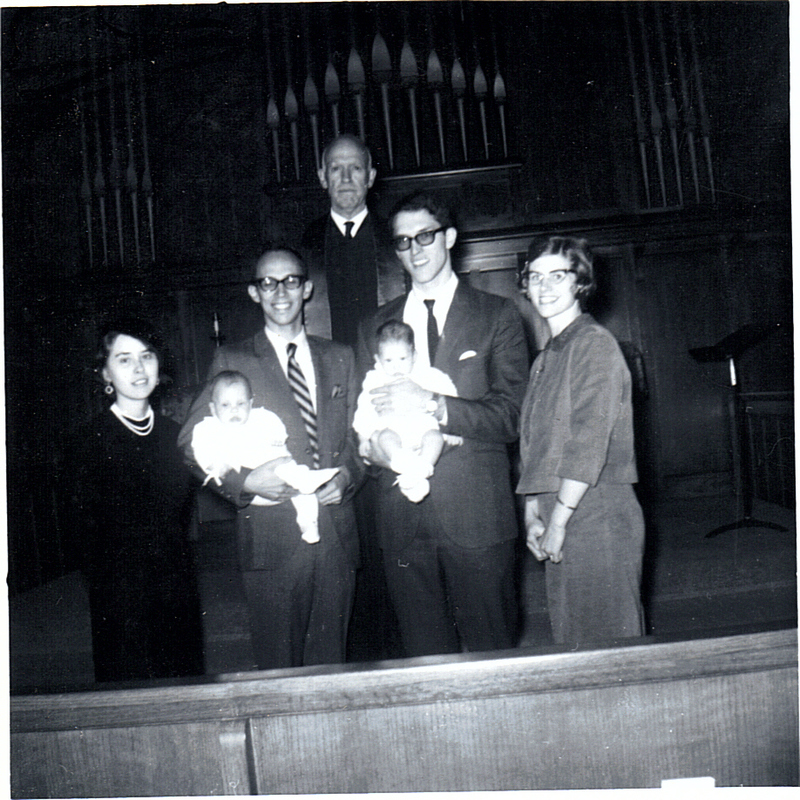 Edward L. Beall, performed the baptism. Kari Jo is the daughter of Howard’s brother, and Prince’s wife Cleone. My new role as mother left me clueless. I stood beside his crib and watched him smile in his sleep. My own parents would be coming on vacation in October to see their first grandchild. That should give me time to figure out what I was supposed to do with the little fellow. One morning I carried him into the living room and sat down in my comfortable chair, arching my legs on the footstool. Brian rested against my legs and looked at me as though wondering “Who is this strange person?” I think I smiled first and said, “Hi!” He smiled. And then I knew we connected. He wrapped his tiny hands on each index finger and smiled again. After that, it was Row, Row, Row Your Boat — The Teensie Weensie Spider, and Pee Paw–a word that eventually became his word for Peek-a-boo! I see you! My parents Gordon Loren Inman and Elva Gail Spence Inman arrived on their vacation trip. I kept looking through the window of the front door for them and put Brian back in his bed. I had already experienced one disaster that morning with a furnace vent cleaner. We had just installed a new furnace in the house. Well, the new furnace was installed a few days previously, but the vents weren’t cleaned out, and the pilot light wouldn’t stay on. So Howard called the people that morning and told them to “get out here” and “clean the vents!” It was chilly that morning. We needed heat with a new baby in the house. The man arrived, blew out the vents, lit the pilot and left. And I stood in the dining room in tears. Having spent several days cleaning the house to make it spotless for my parents, I now needed to reclean it and get it in shape before my parents arrived. Fortunately, the task was quickly finished just as their car pulled up in front of the house. Our dachshund Heidi was elated. She loved my parents and hadn’t been getting as much attention since Brian arrived. “I couldn’t believe you are a mother until I saw your little baby!” my mother told me as we looked at the sleeping Brian. As I recall, they were there about a week. We even went on an excursion to Stephen Collins Foster’s “My Old Kentucky Home.” That was Brian’s first road trip. He did just fine. Did I mention the little squeaky noise he made while being fed? I had joined The La Leche League in Louisville just before Brian was born because I was determined to breast feed him. I took him to a meeting one night and he decided he wanted a night cap. All eyes traveled to Brian as he noisily enjoyed his feast–the squeakiest little baby in the room! Springtime in Louisville took us out to the yard where Brian enjoyed his swing set and playing in his walker. He also had a stroller and a swing, both of which he plainly enjoyed. Howard had started a master’s program in counseling through Western Kentucky University that spring and decided that we would move to Bowling Green in June. So we sold our house and moved to Bowling Green, Kentucky in June 1969. It took us a while to find a place to live there, but we found a place by late October or early November and were in Bowling Green until the following July. 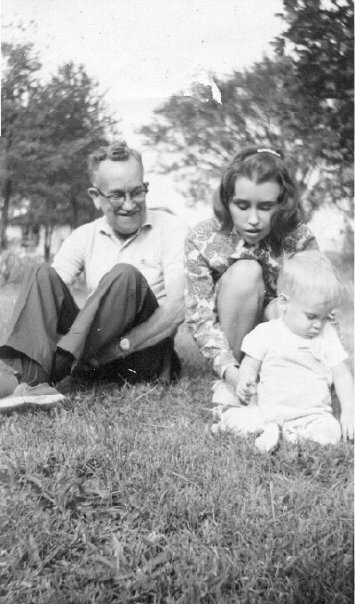 Before the Summer of 1970, however, we made a trip to Cedar Rapids to see my parents, where some generation photos were made. Howard and Brian on the porch of his parents home, Auburn, Kentucky the day he graduated from Western Kentucky University. 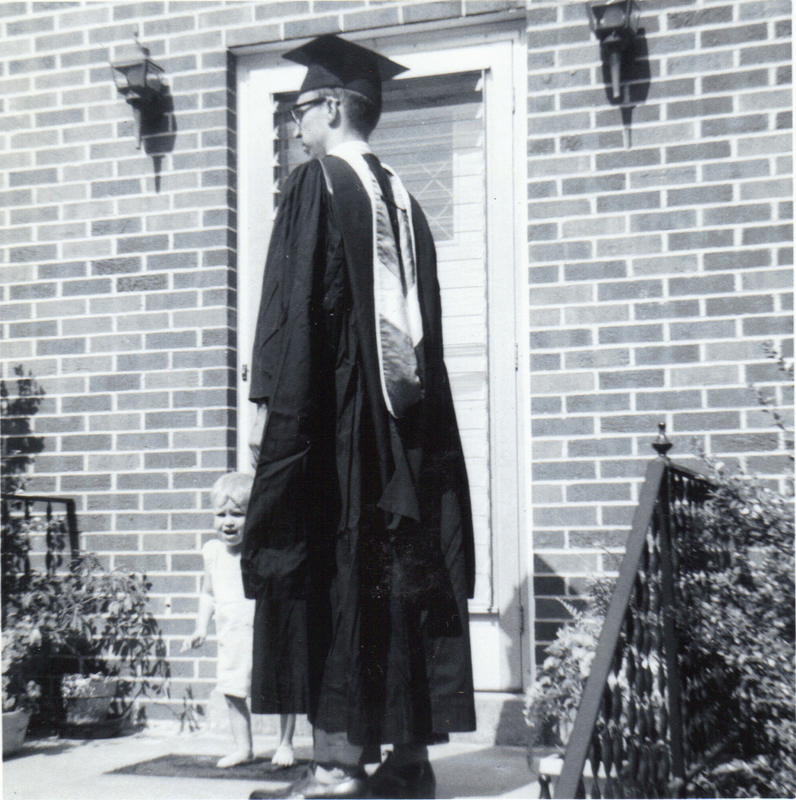 In July 1970, we moved back to my home town of Cedar Rapids, Iowa where Howard had a teaching contract. I was pregnant when we moved there. Brian’s sister Deborah Lee Beall (“Debbie) was born January 12, 1971 in St. Luke’s Hospital, Cedar Rapids, Iowa–the same hospital where I was born. Brian stayed with my parents during the week I was in the hospital and didn’t quite know what to make of a little sister who had just arrived. They squabbled when they were little but bonded well with the passage of time. 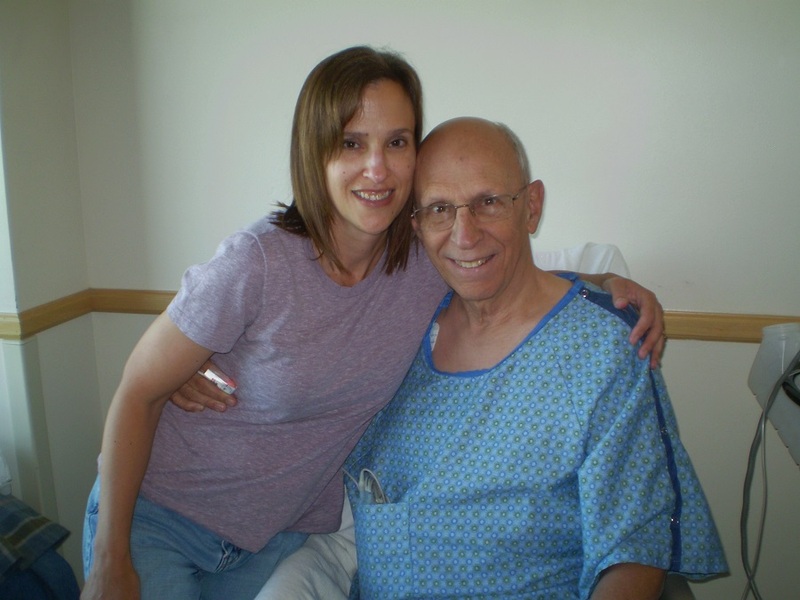 Debbie, a nurse, would become Brian’s “cheer-leader-in-chief” during his last illness. 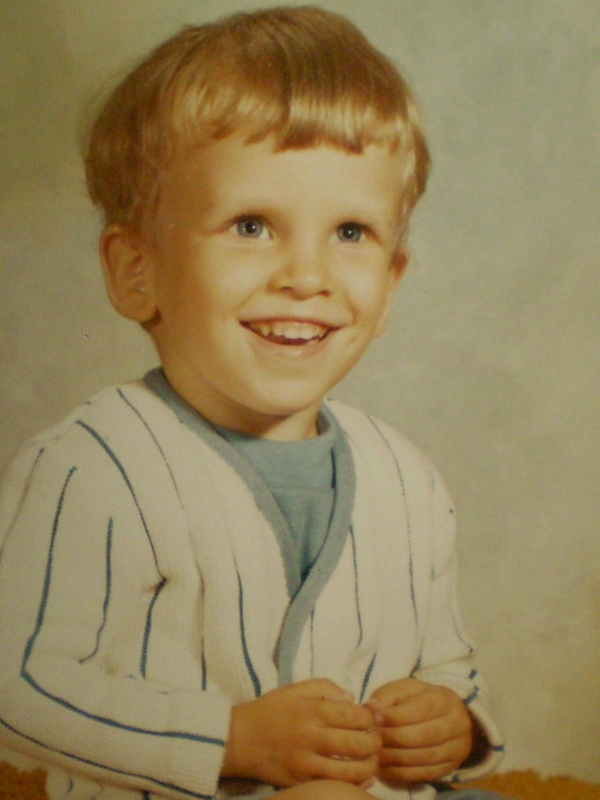 Brian attended Garfield Elementary School in Cedar Rapids from 1973-1975 during Kindergarten and First Grade. We moved to Kansas City, Missouri after my graduation from Mount Mercy College. While in Third Grade at Renner School north of Parkville, Brian became a member of a cub scout troupe. I was the Den Mother for his pack. Our most memorable occurrence? A week of daytime camp activities! “Snakes stay in their holes! 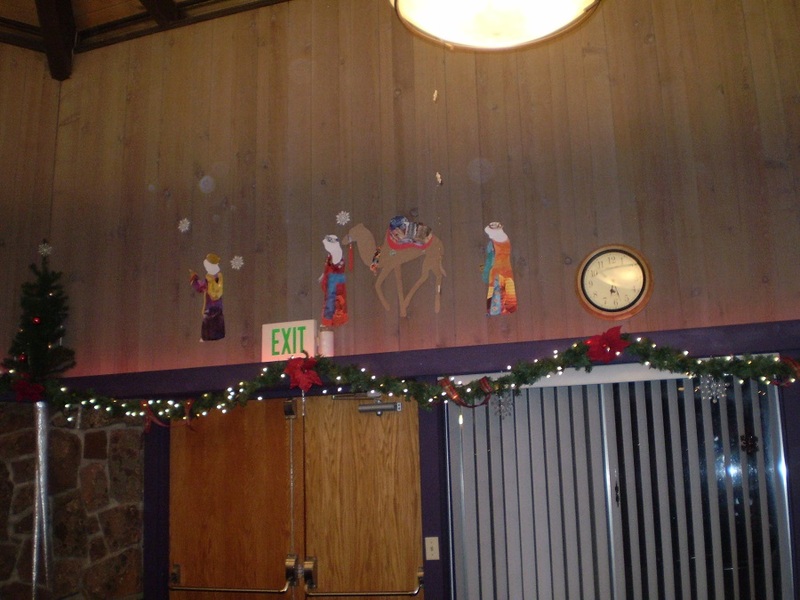 Leave the other wildlife alone!” the cub scouts were told. I remember sitting in a puddle in the pouring rain, wondering how I had gotten talked into this! But for Brian, it was a week of fun. The cub scouts made rockets they shot off the last day of the camp. Brian’s rocket placed second highest. We were in Kansas City until 1977 when we moved to the Missouri Ozarks for a three-year stint. That’s where the frog-in-the-bathtub incident occurred. I had long known Brian had a special love for animals beginning with Heidi the dachshund. He and his sister had a rabbit named Peetie and guinea pigs galore. We didn’t know guinea pigs could be so productive! By the time we moved to the Ozarks, a cat named Louie moved into our house. He belonged to the former residents and took off for the woods the day they were moving. Louie was joined in December by Heidi the poodle. She belonged to Howard’s parents, and they let us take her back to Missouri with us. Brian thought that all of nature belonged in the house. Besides the frog, Louie and Heidi, Brian brought a box turtle named Red Top inside the house, as well as a rabbit named Christie. We also had a pony named Red. Brian did not attempt to bring Red indoors! Brian had a couple of gold fish named Bubbles and Fattie. When the goldfish died, Brian took them outside and buried them beneath our bedroom window. Then he placed tiny crosses on their graves. And then he wanted to have a funeral for them. Howard joined the ceremony and said a prayer for the fish. I had never witnessed a funeral for fish before. The big problem was keeping Louie from digging them up. The pet drama continued well into our move to Colorado. In seventh grade, Brian rescued a cat named Lucky. One of his teachers was looking for a home for Lucky, and Brian volunteered. Lucky died just before Brian entered the Army. I guess he sensed Brian was going away for a long time. Several years later, he brought our little cat, Shadow, home while out making pizza deliveries. Shadow’s owner was a rookie for the Denver Broncos that year. He and his wife felt sorry for the kitten when they were gone. We had several additional rabbits, a dog named Gigi, a second Louie cat, a hamster named Tidbit and much later, our daughter Debbie’s dog Ramsey. In the end, Ramsey and Shadow lived with us the longest. Both have been gone for some time. Shadow died in 1997; Ramsey died in 2005. Brian went on to acquire his own pets after his marriage: a cat named Cheeto, a German Shepherd named Thor–both of whom lived a long time. Another dog named Sparky joined the club and died about a year ago. Some years ago, Brian and LuAn adopted two cats from a rescue place: a Siamese named Moe and a big bundle of love named Melvin. Melvin is the lone survivor. We often thought Brian should have been a veterinarian. He delivered newspapers in junior high and later delivered papers as an adult for extra cash. “All of Colorado should be proud to have such a wonderful paper boy!” one client wrote the supervisor. “He’s the best newspaper deliverer I’ve ever had!” wrote another. Brian and school did not mix well during his junior high and high school years. He was a visual learner, and he was dyslexic. 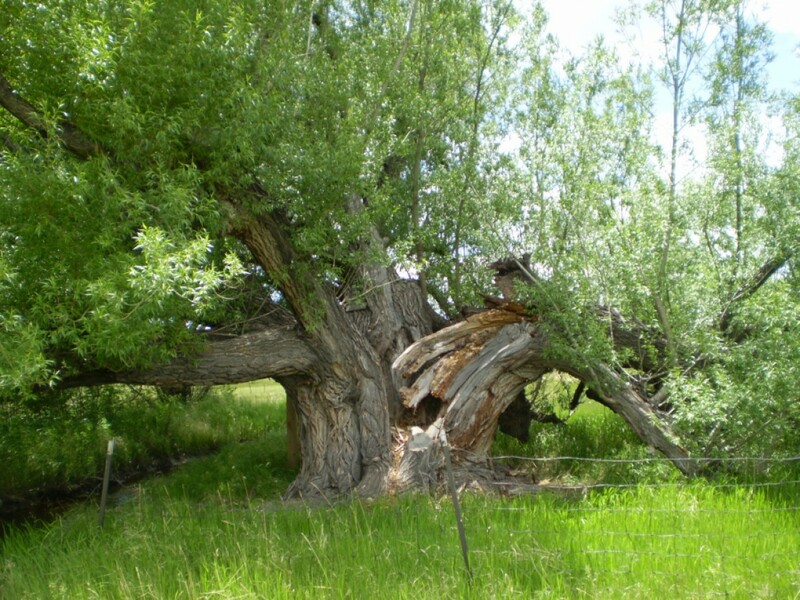 When he was in seventh grade, he made a family tree book–something his dear old mother helped him with. I gave him the pictures; he wrote the stories to go with the pictures. Of course I told him the stories as he wrote them. “Only A+” I ever got!” he remembered. By high school, he was completely bored. Howard and I turned gray over his driving escapades as well as his speeding tickets. So Howard enrolled him in Front Range Community College in Westminster, Colorado. 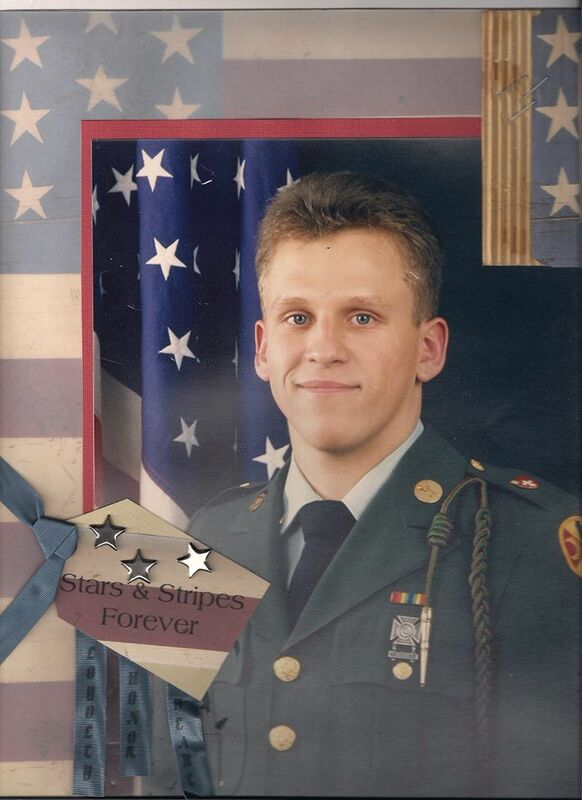 He joined the Army after graduation, where he became a field artillery surveyor. 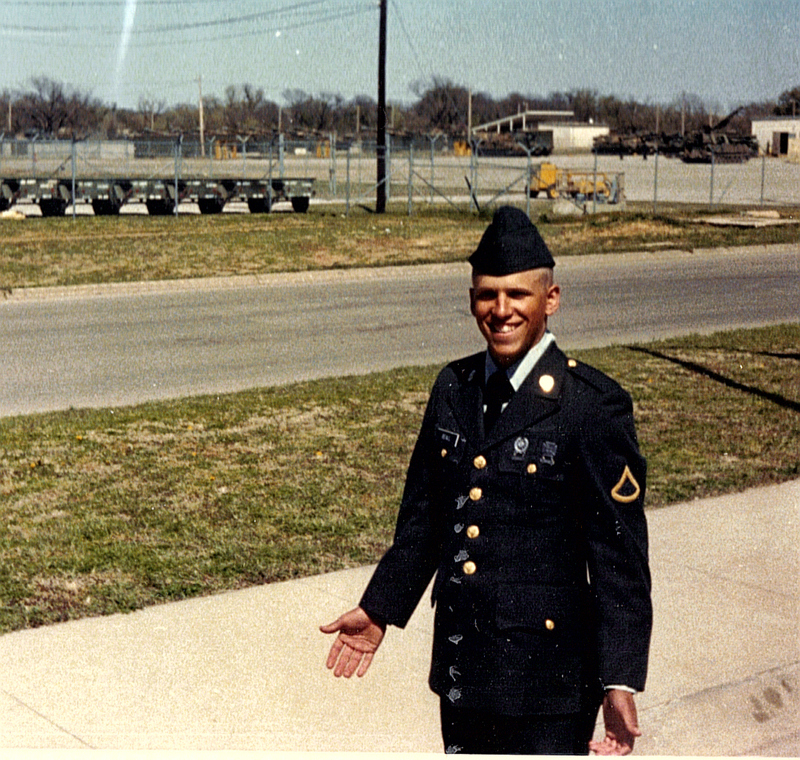 He did his basic training at Fort Sill, Oklahoma and then went to Germany for the rest of his tour where he served at Herzo Base. He was awarded the Army Achievement Medal for Perfect Service. After his discharge, he returned to Denver where he rejoined his family. In May 1990, I received my master’s degree at the University of Colorado of Denver. Brian came to my graduation and while we were posing together in the front yard, Brian told me, “Mom, I met someone last night. Her name is LuAn!” He had fallen in love with a woman while in Germany–something that didn’t work out. And then he met LuAn. 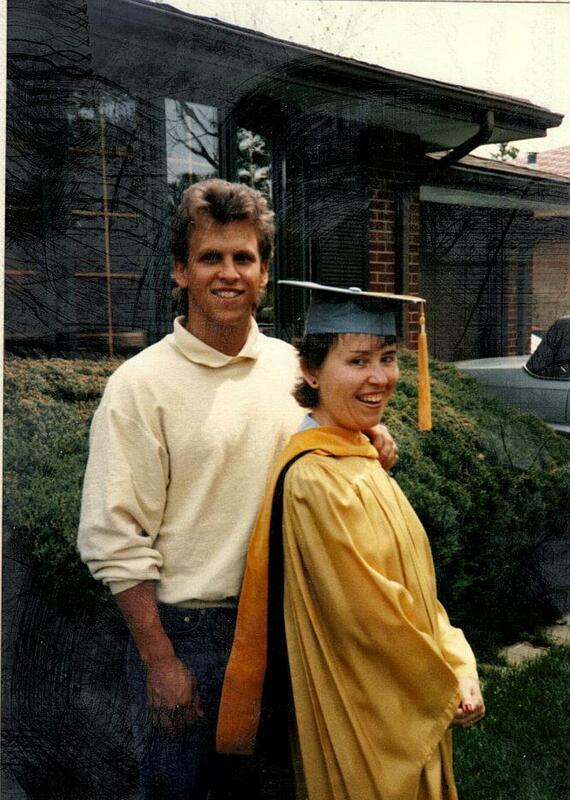 Brian and me the day I received my Master’s Degree, May 19, 1990. 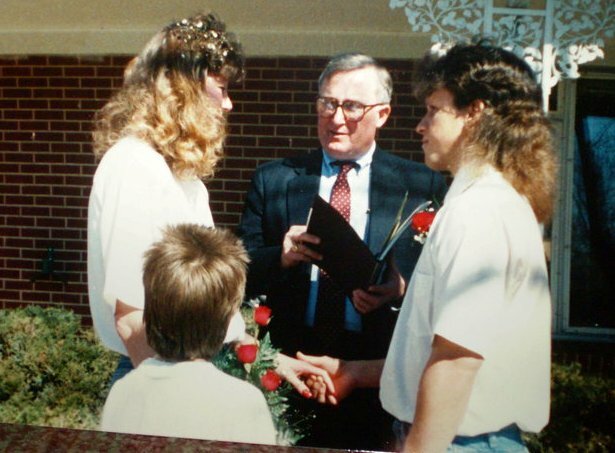 Brian and LuAn were married in the front yard of their home March 9, 1991. 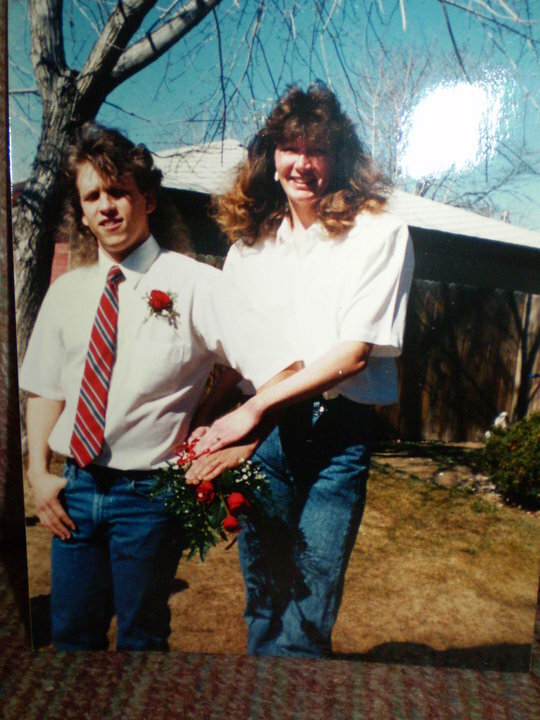 March 9, 2016 would have been their twenty-fifth wedding anniversary. The following year on August 22, 1992, Brian’s sister Debbie married Dee Wall. Jr. in our back yard. Brian was the disc jockey at her wedding. Brian worked ten years for Jolly Rancher Candies and two years for Budweiser. He graduated from Red Rocks Community College in fire science. 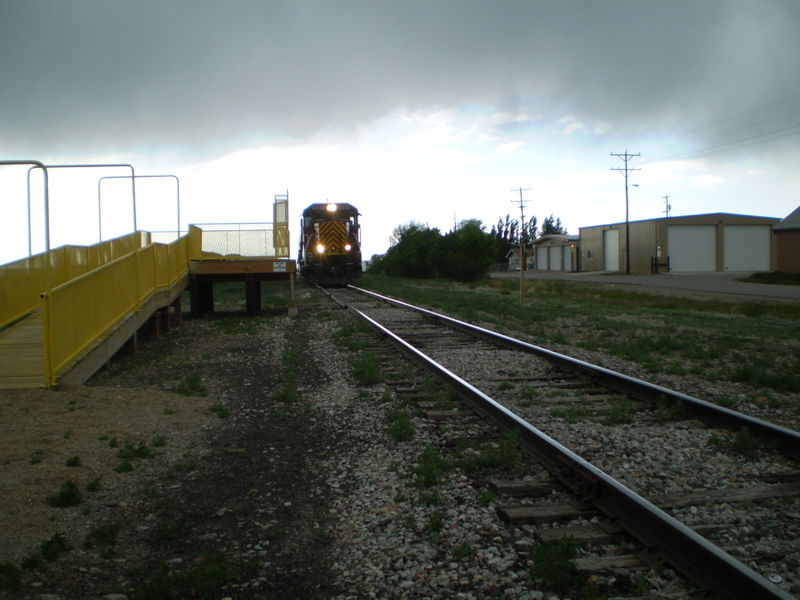 In 2003, he became a locomotive engineer for the Union Pacific Railroad, where he worked for fourteen years. A lover of sports, Brian organized a softball league with friends from Jolly Rancher. As I recall, they played for several seasons. He traveled extensively with the railroad including a several month stint in Illinois. He loved to travel–a love he acquired while in Germany. He and LuAn made several trips to the Indianapolis 500. He wanted to go to the Kentucky Derby but didn’t make it there. He even had his name on a season ticket list for the Pittsburgh Steelers. That would not come to pass either. 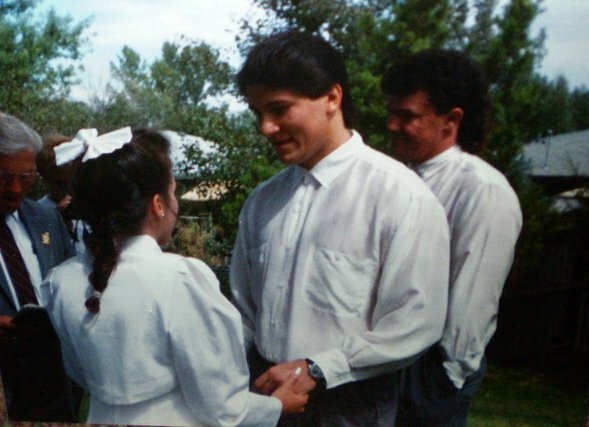 About five or six years ago, Brian and LuAn joined Calvary Chapel in Broomfield. They were both immersed–the second time for LuAn and the third time for Brian– and they became active participants in their church. They went on a Healing Waters Mission Trip to the Dominican Republic in 2012 or 2013. Brian and LuAn co-founded the Bean Saver Project that feeds hungry children. That project is still active. 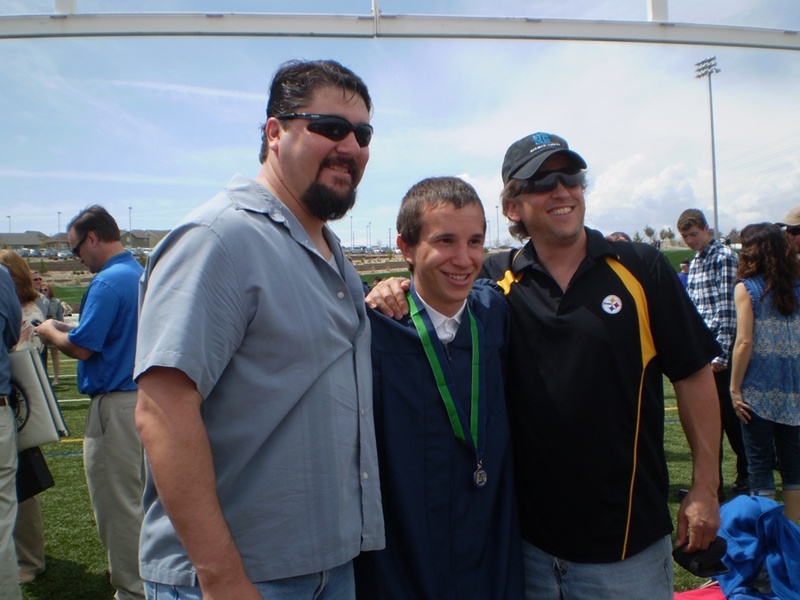 In May 2014, Brian went to a high school graduation in Parker, Colorado. Jason Wall, one of our grandsons and Brian’s nephew, was graduating from Thunder Ridge High School in Douglas County. I remember sitting on the bleachers, looking for Brian. Presently, he arrived and sat on the bench next to me. 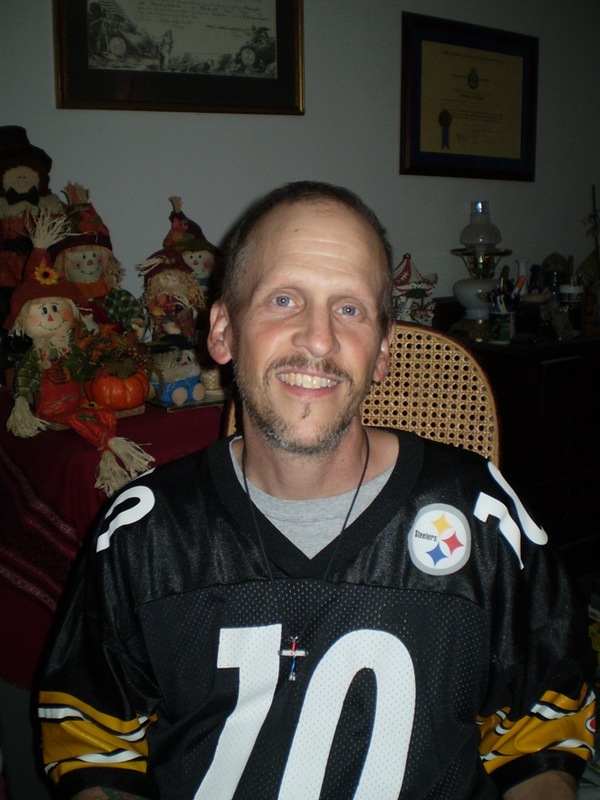 He was dressed in his Pittsburg Steeler’s attire. Brian seemed fine that day. After the ceremony, we went to Debbie and Dee’s house for food and celebration. An hour or so later, Brian went into the bathroom. When he came out, he said he was going home. We didn’t think anything about it at the time. Then in July, he drove over to our house and said he had something to tell us. “I have cancer!” he said. Of course, I didn’t want to believe it. Our daughter was diagnosed with the beginning stages of breast cancer two years previously. She underwent a double mastectomy and hasn’t been troubled with it since. But during her ordeal, they discovered a mutant gene in the family that makes a person carrying that gene more susceptible to any form of cancer. Brian had the same gene. 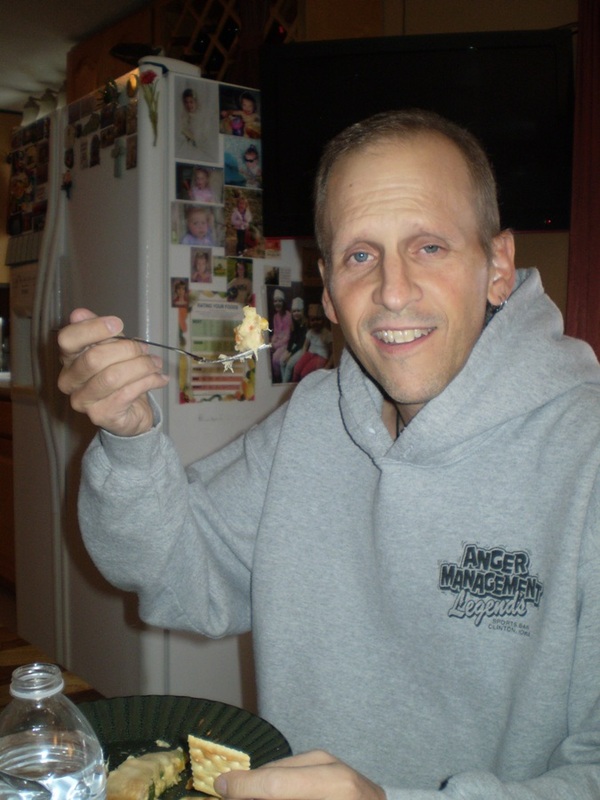 He was suffering from Stage 4 esophageal cancer. Surgery was scheduled for October 22, 2014. And Debbie organized a team of supporters on his behalf called Team Brian. 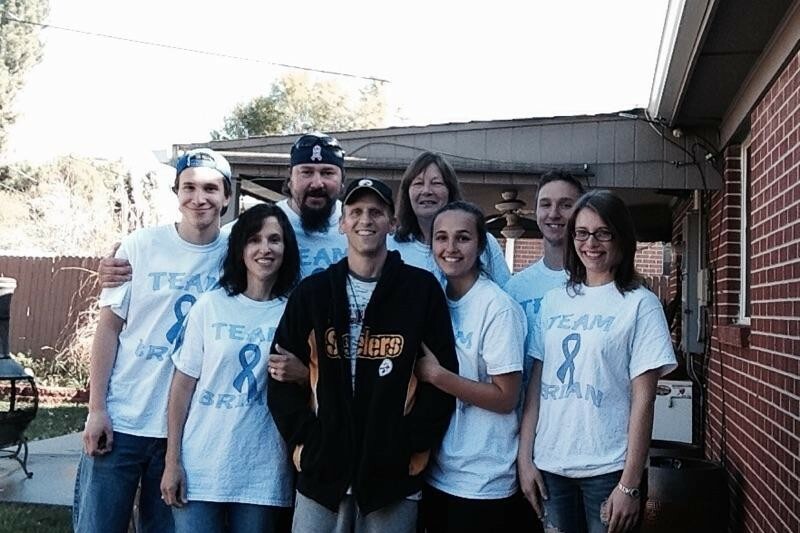 Brian underwent his surgery on October 22, 2014. At that point, the operation was successful. They had to redo his esophagus and cut out about half of his stomach. He believed he was cancer free. He would return for a check-up in January. But he really seemed great that fall. And we believed the cancer was gone. In January 2015, he began a three or four month heavy deluge of chemo. He became so ill, he couldn’t keep food down. The doctor told him he would fight cancer the rest of his life and by fall, forbade him from ever returning to work. And so began the alternating periods of chemo-non-chemo-hydration, etc. which eventually took their toll on him. I might add that Brian and Debbie were quite adept at keeping us out of the loop on all of this. The first time I learned he was in the hospital was in September 2015. He called saying he needed a ride home! So we drove to the hospital to pick him up. He told me he would be waiting in the lobby. I didn’t see him, so I asked the lady sitting at the front desk. “He’s still in his room!” she told me while giving me the number. When I knocked on the door and opened it slowly, there sat Brian, eager to get out of that place. He needed to go in for hydration and had been there a few days. The last time we saw him when he looked good was on Veteran’s Day, November 11, 2015. He went with us to Applebee’s for their Veteran’s Day Special. It was the first time he had an evening out without going to a doctor or hospital since this whole thing began. 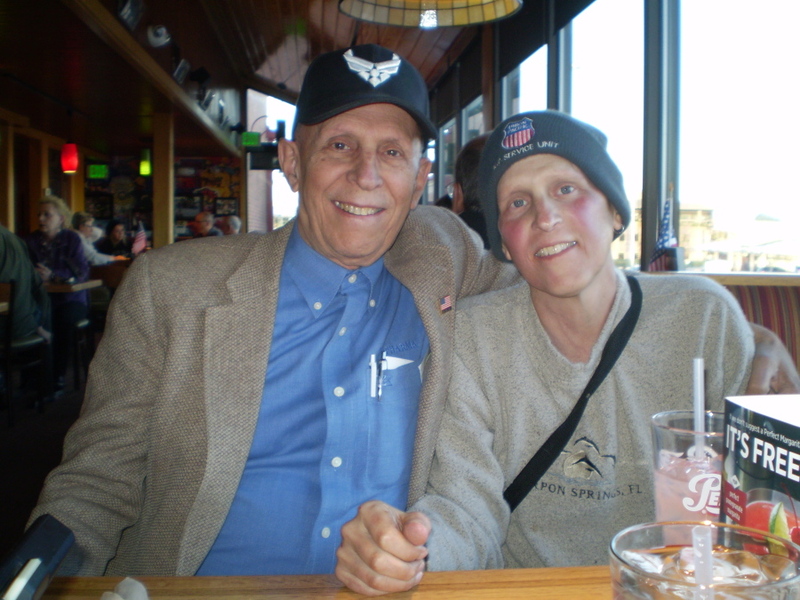 We left Applebee’s that night confident Brian was on the mend. Christmas told us another story. 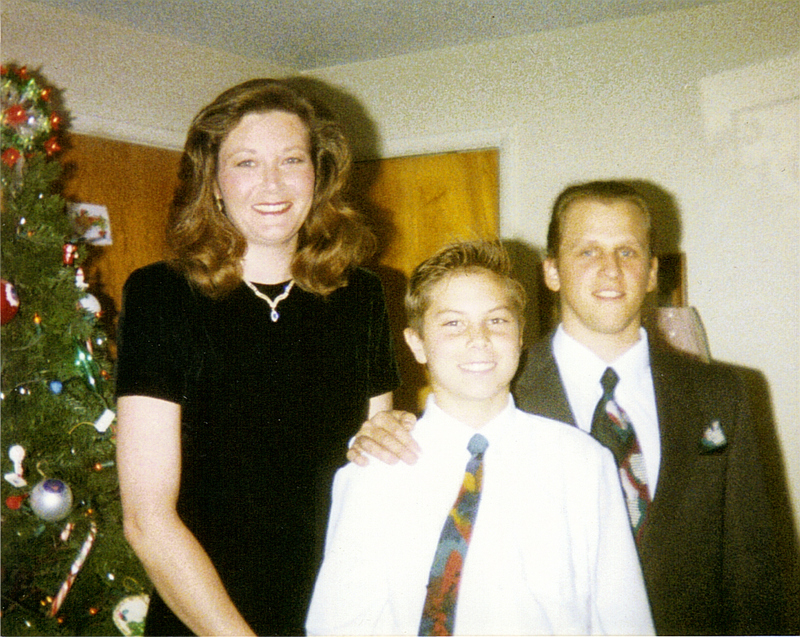 Brian called on the 23rd, announcing Debbie had arrived, and he wanted us to come over for our Christmas. I remember saying, “Right now?” When we arrived, we saw a different Brian. He did not look well at all, and his legs were swollen with edema. Nevertheless, we carried on with our celebration and went home. Brian spent the first three weeks of 2016 in the hospital. He went home, but was no better. So he went to another hospital and was told the other hospital had not been treating him properly. He had gained 51 lbs. of liquid on his legs! He was in that hospital for another week getting re-corrected. I’m not sure whether he was in the hospital in early February. But he began having difficulty breathing. In my last telephone conversation with him, he told me his cancer had spread into his intestines and elsewhere. So I knew it would take a major miracle for him to be healed during this side of life. LuAn drove him to the hospital on Sunday afternoon, February 28, 2016 about an hour after we talked with him on the phone. He said he couldn’t talk long because of a shortness of breath. He didn’t go by ambulance and was a walk-in. They said he had fluid on his lungs. On Monday, they planned to drain it. They would keep him overnight, and LuAn could pick him up and take him home on Tuesday morning. I don’t know whether they drained the fluid. But on Tuesday morning, March 1, 2016 Brian passed away at 7:10 A.M. between the shift change. The night shift checked on him as they left. He was alert. The day shift arrived and checked on him, and he had passed. LuAn arrived on the scene and discovered that he had died. Debbie called us about 9:30 and told us we needed to go to the hospital because “Brian passed away this morning.” The cancer didn’t kill him. I believe the pneumonia did. Our sweet Brian was gone! The room was empty. The others went out in the hallway. I stood beside the bed and held and kissed his hands. My sweet baby was only 47 years of age! I remembered holding him in my arms and kissing his tiny little face after he was born. Presently, I grabbed the metal bar of the bed and pulled myself up in bed beside him. Then I kissed his face–told him I loved him–and said goodbye. After a passing, tears flow with fond memories of a loved one gone. Brian will forever be in our hearts. His memorial service is Tuesday, March 15, 2016 at 2:00 P.M. at Calvary Chapel, 1200 Miramonte, Broomfield, CO–an informal service. Brian would have wanted it that way. 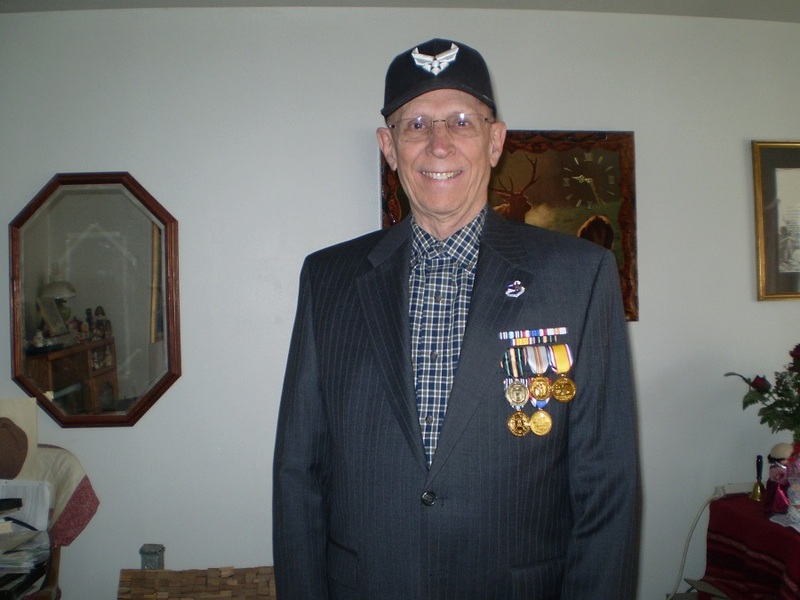 He will have a military burial at Fort Logan National Cemetery in South Metro Denver at a later date. More than likely, that will be in April. A leather cover will deck Brian’s urn. He was a leather-type of guy and would have liked that as well. Brian was called “Bri” and “Brian” by Howard. I called him “Honey” and “Brian”–and yes–occasionally Brian Scott Beall! –but not recently, thank goodness! LuAn called him “Honey”–a term he called her as well. Brandon called him “Dad.” And four little girls–Trinity, Kanoe, Brooke and Delaney–called him “Pappy.” Debbie and Dee’s children-Joshua , Jason and Amanda–called him Uncle Brian, as did a host of nieces and nephews named in his obituary. He was a nephew in his own right to Dickson and Joan Beall, Prince and Cleone Beall, and Edward Leyburn and Marilyn Beall–Howard’s brothers and their wives. His Uncle Ley called him “A.J.”–a term inspired by some of Brian’s early driving activities. He was “Cuz” to a host of cousins. Most people called him “Brian”. 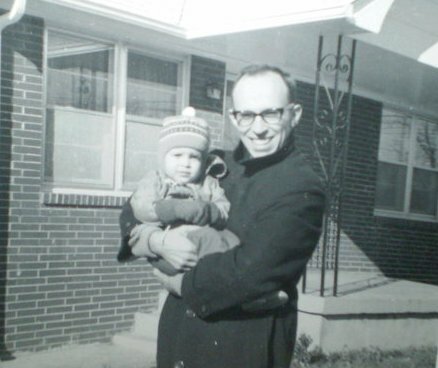 Some people called him “Mighty Mouse” because he was short and able to “bend steel in his bare hands!” My Grandfather Spence called him “Bub” the first time he saw him at four months of age. Brian will be missed by many. 2. He was born in St. Anthony’s Hospital in Louisville, Kentucky, and passed away in another St. Anthony’s Hospital. 3. 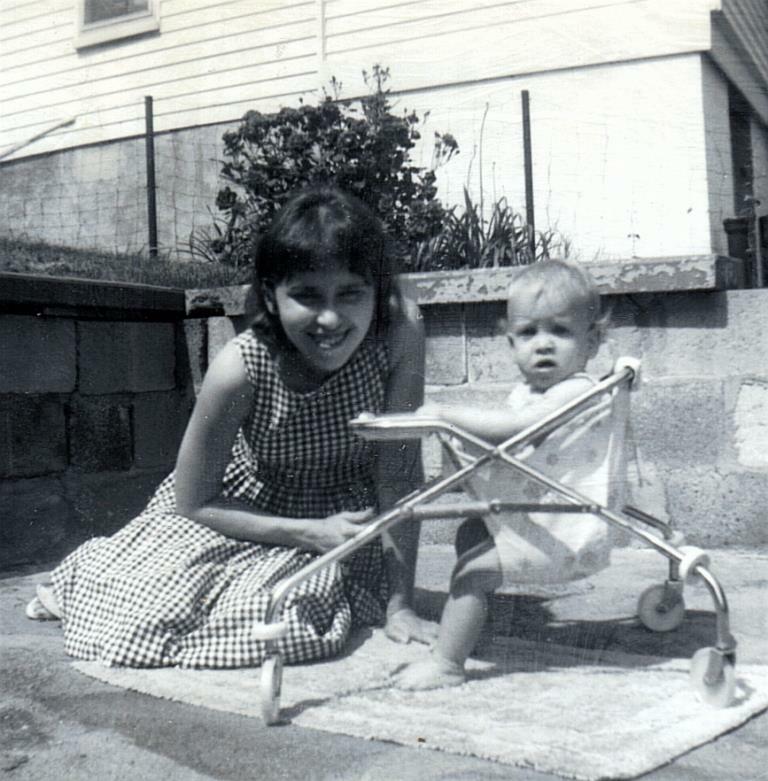 When Brian was born in 1968, a crazy presidential campaign was underway. We were watching the Republican Convention the night I went into labor and had just heard Eisenhower’s speech when things within my body began happening. Brian was in this world during the Democratic convention–that crazy thing in Chicago resulting in the Democratic implosion. When Brian passed away in 2016, another presidential campaign is underway and viewing the cast of characters involved, there is probably another implosion enroute..
4. Brian was born August 6, 1968 and passed away on March 1, 2016. There are five months between March and August. If you add one day, you get the number “6”). (Kind of a wacky connection, but it is there). 5. Brian’s wife LuAn was born and raised in southern Indiana, just across the river from Louisville, Kentucky. She once joked and said, “I was probably the girl who winked and smiled at you in a grocery store!” They met in Denver, Colorado. I was trying to think of a connection between Kentucky and Colorado, and this must be it. Her father lived a few blocks from our house in Louisville during the time that we lived there! I recall reading an article the day after Brian’s passing about some strange radio signals from outer space. The signals are sporadic and come at unpredictable intervals. They are several light years away, but they are really beginning to puzzle the people who are studying them. Brian’s obituary went online this morning and may be read here. 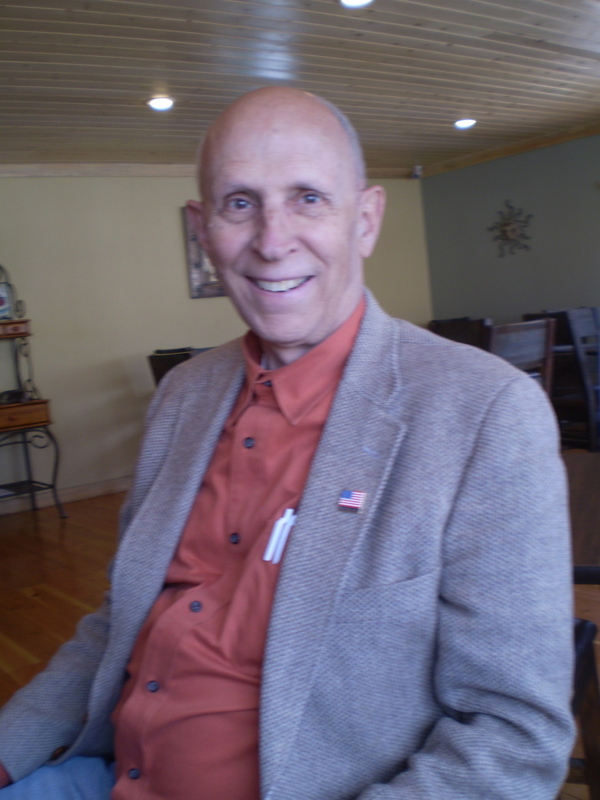 His memorial service is March 15, 2016 at Calvary Chapel in Broomfield. He will be buried later at Fort Logan National Cemetery in South Metro Denver. 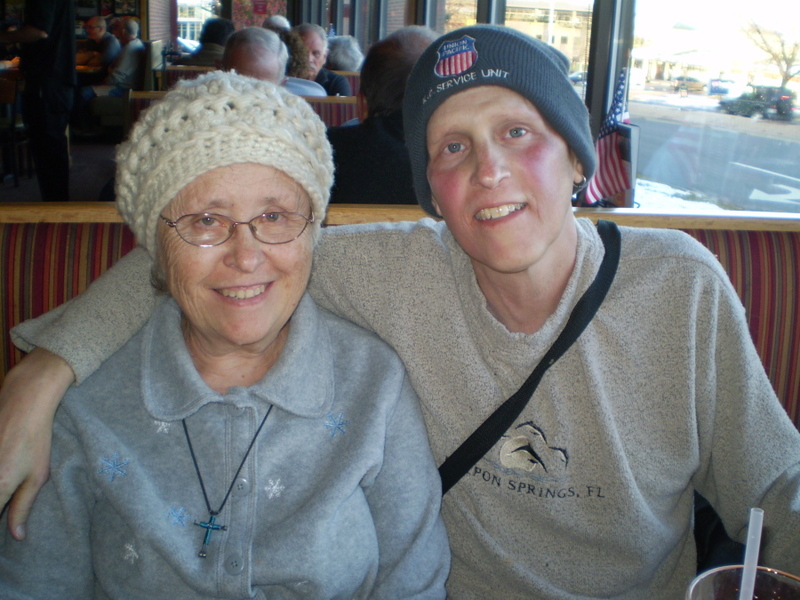 Our precious son, Brian Scott Beall, passed away this morning at St. Anthony’s North, Broomfield, Colorado. He fought cancer for two years.